There had been a large influx of immigrants to the East Wall and North Wall area in the late nineteenth and early twentieth century and the many of these immigrants came from Glasgow, including my grandparents. Some came to work in the shipyards as skilled craftsmen, some in other trades, some were unskilled labourers. Most of them settled in the city, never returning to Scotland. The majority of these people seem to have assimilated in to the Dublin of the new Republic. What remains today is little more than ever fading family stories and ever fading links with families in Scotland. One great reminder of these times and people are the row of houses on Fairfield Avenue locally known as the ‘Scotch Block’ built for Scottish tradesmen working in the newly formed Dublin Shipping Company at the beginning of the 1900s. These immigrants seem to be to be a forgotten generation in our Irish history books, I have no recollection of this aspect of our cities story being taught in school. These people and their descendants had never been given a voice to me until I read the work of John Murray (1855-1911), an engineer and poet from Glasgow. His verses gave me a feeling of insight into these people who had come from far to settle in a strange town, at that time a town in the United Kingdom, only to find themselves isolated by religion and culture and eventually by politics. Having adapted sixteen of John Murray’s poems and set them to original music in the collection ‘Govan Rhymes and Other Poems in Song’ I used the language and style suggested by these verses to help me compose a set of original songs set in the same timeframe and style. The content of the songs are based largely on my own family stories and on research I have done into some of these immigrant families. 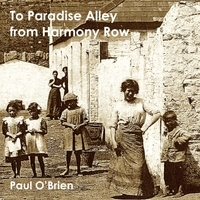 I have bundled these songs into the collection ‘To Paradise Alley from Harmony Row’ as a tribute to this unsung generation of immigrants that played an important role in the history of the city of Dublin. There are three songs about the Nimmo family, “To Paradise Alley from Harmony Row” about the parents James and Rachel who come from Possile Park in Glasgow to live in shared rooms in a house on St Mary’s Road, moving later to house number 44 on the Caledon Road. The title “Paradise Alley” comes from the writer John D Sheridan who was born and raised in Glasgow. He was a teacher in the local primary school and he wrote a novel based the school and its pupils during the lockout and rising called “Paradise Alley”. This book has been republished with help from the East Wall History Group. In the area I have worked with in in Glasgow, Govan, the local primary school was situated on a road called Harmony row, this was my inspiration for title and chorus of the song. James and Rachel had two sons, Thomas and James. James was a drummer in the Connaught Rangers, joining up in 1909 and serving in India then in Flanders. He was killed at the battle of Neuve Chappelle on the 3rd of August 1915, his brother Tom became a Connaught Ranger too and he survived the war. I wrote Toms story in “A wee bit of Scotland Here” and James’ song is “Roll on the end” both using basically the same melody. I found a letter home from James in the war archives and I used some of his own sentences in the song. There is another three-song cycle about a Docker who enlists (“Joining up”) and song from the viewpoint of his wife (“the Somme”)and who eventually returns wounded from the war (“My Handsome Stevedore Returned”) again from his wife’s viewpoint and based on the song “My Handsome Stevedore” form the CD “Songs from the North Lotts” which described a happier time for the couple. Paddy Byrne my great uncle who lived on Church Street was a Dublin Fusilier and he died at Suvla in 1915, his story is told in the song “On the Beach 1915”. “the Poor Cobbler” is my very own James Connolly song, looking at him as a family man, born in Edinburgh and dying for a cause he believed in.